Left: Proclamations. 1576-12-14. London, 1576. via folger.edu. 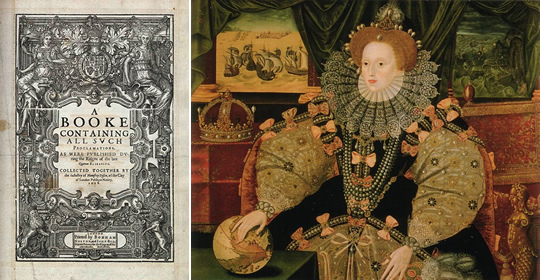 Right: The Armada Portrait of Queen Elizabeth I, attributed to George Gower, c.1588-89. Queen Elizabeth I (1533–1603) has been a leading lady throughout the ages. The daughter of divorce-happy Henry VIII has been written about at length; she has inspired movies, plays, and artwork; and her strict politics were felt throughout Europe (she effectively outlawed Catholicism). But we at Eat Me Daily don't really give two ducats about that stuff. We're interested in how she affected food. Yes, she made a lot of proclamations involving alcohol — the majority of food-related proclamations involved the pricing of wine. And then there's that one about measuring the Scottish fish barrels, because we know how sneaky the Scots can be when making fish barrels. On a side note, she also made a lot of proclamations regarding pirates and Frenchmen. But back to the alcohol: It was very important in the 16th century due to the undrinkable state of the water. Rather than risk dysentery and other unpleasant gastro-diseases, the people of the 16th century drank alcohol; while they were escaping the risk of illness they were also maintaining a nice buzz throughout the day. The book To The Queen's Taste: Elizabethan Feasts and Recipes Adapted for Modern Cooking (buy at Amazon ), by Lorna J. Sass, explains that "[Beer] was prepared in three strengths: single, double, and double-double." The Queen herself is said to have consumed two pints of beer (single strength...weak) with breakfast on a daily basis, which is why I plan on emulating the Queen more regularly. Though Queeny was a bit of a buzz kill at times. In 1560 she ordered that the brewing of double-double be stopped. Her Majesty was also very instrumental in meat-free Fridays. 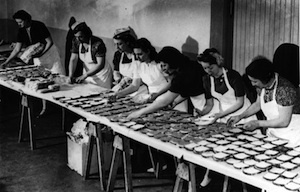 According to To The Queen's Taste, "In 1563, by an act of Parliament, Elizabeth proclaimed that her countrymen had to eat fish on Wednesdays, Fridays, and Saturdays. Infraction of her command was punishable by three months' imprisonment or a three-pound fine." Though the law was rooted in religion, it was really implemented in order to boost the English shipbuilding industry and lower the cost of meat. She was a sneaky magistrate. Apart from booze and seafood, Elizabeth and her court dined on copious amounts of sugary treats like marchpane, a kind of marzipan or suckets (dried fruits). She liked them so much that her teeth ended up turning black. But one of the many benefits of being the Queen is that you can do no wrong. In an attempt to resemble their ruler more, the ladies of the court blackened their teeth. Pretty. In this way I will try not to emulate her ladyship.